You might be able to create an interesting parallel to the blame on music for various school shootings. Who's responsible if some people are unable to handle a message? I think the most salient example of blaming music for various school shootings is Columbine. When Eric Harris and Dylan Klebold shot up their Colorado high school back on April 20, 1999 the fingers began pointing at Brian Warner aka Marylin Manson. In fact, politicians began lining up behind anti-Manson groups that aimed to discourage people from listening to the singer. Manson, out of respect for the victims of the Columbine massacre, canceled the rest of his concert tour, while making it clear that he felt that music and goth culture were being scapegoated. Other musicians caught flack, including bands like KMFDM and Rammstein. At the time, I believed that the arguments that bands like this contribute to an atmosphere that would facilitate a school shooting or some other act of mass violence to be ridiculous. I still hold this view. There is one absolutely crucial difference between talking heads like Palin and Limbaugh and musicians like Marylin Manson or Eminem (another target of blame for various school shootings). Palin and Limbaugh masquerade as serious people; in other words, they are reported on in the media as having something to add to a national conversation about politics or society. People like Marylin Manson and Eminem are entertainers. They're not here to get out some political message or get us to vote for one person or another. People turn to music and entertainment to get away from all the crap they have to put up with on a daily basis, not to learn more about it. 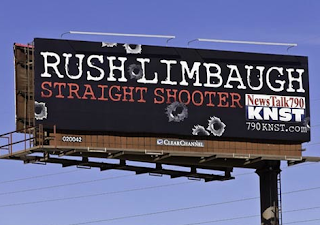 Now, in reality, Palin and Limbaugh are on the same plane as a Marylin Manson or Eminem entertainment-wise. They get paid millions of dollars to entertain. Unfortunately, given the lackluster media America turns to for information, Palin and Limbaugh are treated as something more than entertainment. They're treated as leaders of a conservative movement fed up with anything remotely liberal or centrist. If they are going to revel in this role (which they clearly have) as well as enrich themselves from it, it should come as no surprise that they will be held responsible for helping to expand what Ross Douthat called "the darkness" last Sunday. And then there's personal responsibility. Let's not forget who's really in trouble here. Jared Loughner is behind bars without bail. Palin is not being arrested or fined or anything like that. She is being criticized for being a hack, and rightfully so. 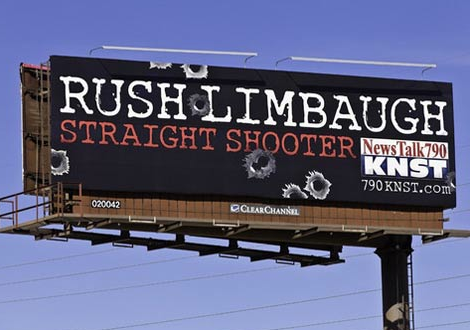 People pointing out that Palin used violent imagery on her website or that Rush Limbaugh had an extremely violent billboard is not "blood-libel" (a term used out of sheer ignorance on Palin's part rather than malice). The statements saying "Violent imagery like this is not appropriate in the wake of the Tucson tragedy," misses the point. It was not appropriate before Representative Giffords was shot and it remains inappropriate today. Jared Loughner is clearly a nutjob. I would argue he is unable to handle many things, the least of which is violent imagery by leading political blowhards. But if this is the case, why arm someone with this type of message? This would be like me giving every person in America a gun and then when violence breaks out escaping any type of responsibility by saying, "Well, clearly these people could not handle the responsibility of a firearm." I think it bears repeating: Sarah Palin is not to blame for the Tucson tragedy. She is to blame for adding to increasingly violent rhetoric surrounding politics. Take the Tom and Bill example from Monday. Tom wanted Bill to get hit by a bus. Bill got hit by a bus. Obviously Tom didn't cause Bill to get hit by the bus, but he's still a jerk for saying it. Was Loughner influenced by the rhetoric of "leaders" like Palin and Limbaugh? We'll never know because his mind is so messed up that anything he says is suspect. What we do know is that Palin put a gun sight over Giffords' district and Giffords was shot in the head. If you want to use all of this violent imagery and then violence occurs, be ready to deal with a lot of scrutiny, whether you were directly a part of it or not. To quote Representative Giffords: "When people do that they've got to realize that there are consequences to that action."